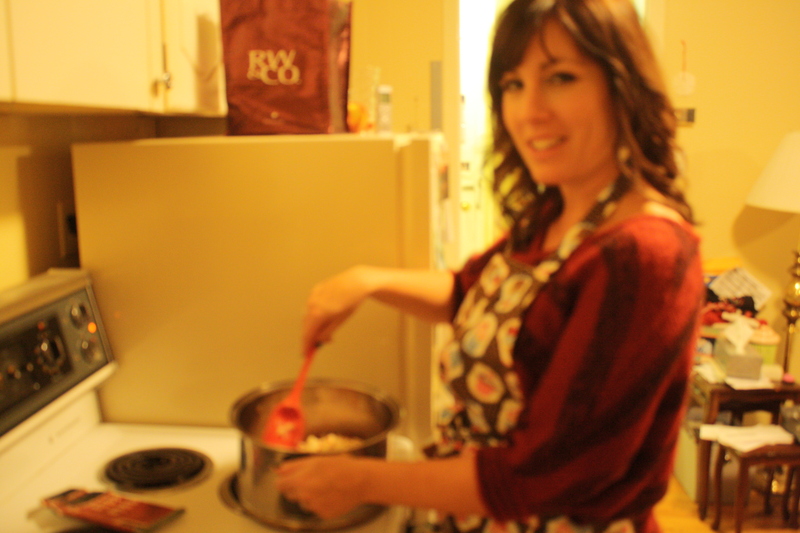 On Thursday, I had my third cooking lesson, the first by a non-relative, my friend Kimberly Furtney. Or, as she is known to me and my family, Kimber, K-Furt, The Furts or, that time when she went to Germany, Kimberlin Strudel. For the purposes of this article and your ease of reference, I will refer to her simply as Kim. Kim is a piece of sunshine in the life of my family. She has such a loving, giving spirit and from the time we met, she has done so much in the way of brightening up our lives. She is known especially to be a cheerleader, send notes of encouragement, and give treat-y gifts… like the time when I was sick with a cold and she brought over a care package: movie, home-made muffins, lozenges and ginger ale. 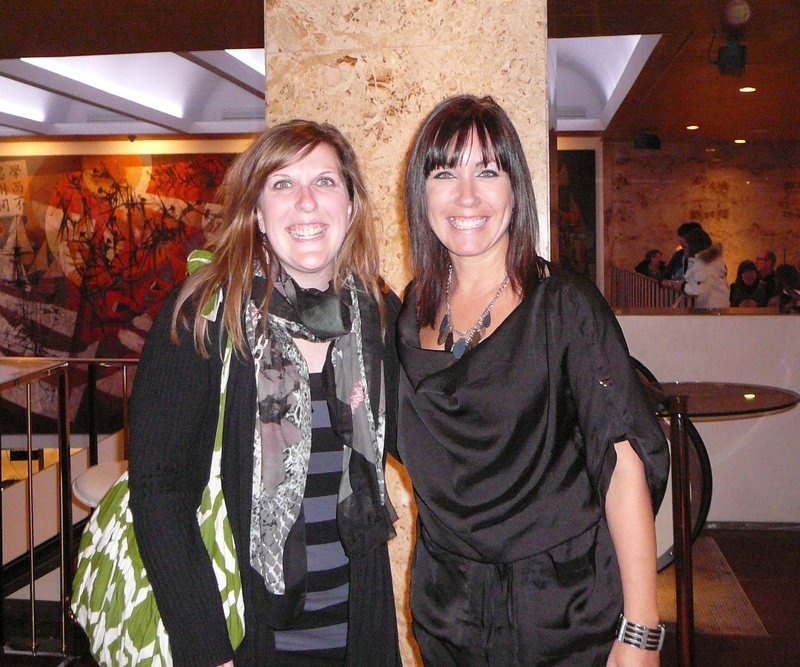 This is Kim and me at the Sony Theatre in Toronto for the “So You Think You Can Dance” Live Tour. She treated me for my birthday. I am a teacher and love my job even though I am very busy all the time (except for two months of glorious summer). I like to try new things. I play the piano and love to sing. I get cold easily. I lived in New Zealand for a year and consider Aotearoa my second home. I love sunsets, waterfalls and clouds. One time I got offered a job at McDonalds while I was ordering chicken mcnuggets. I wish I didn’t like coke classic, but I love it. I have been in eight weddings. I like candy. I have the best people around and think my church is pretty cool. I grew up on a cherry farm. I loved being a camp counselor. I used to be a waitress. I have also been a sandwich artist. I try very hard to follow Christ in all of my life. I practically live in pajama pants. I have the cutest nephews ever. I have an electric blanket on my bed. I direct plays and musicals. I’d like to learn to play more instruments. I have a collection of musical clothing and I own a pink ukelele. I do not like sports. I like blogging. I have curly hair. I have walked into someone else’s home thinking it was my own. I try to be a good host. I like to bake but rarely eat my own baking. I was part of the original Foxes’ Den (dorm 10). I worry. I do not have a five year plan. I wish I was a good dancer. I like to wear dresses. I don’t like coffee and I am trying to like tea. I like wearing fun jewelry. I will always drive the distance. It doesn’t take much to make me cry. I love giving cards and gifts. I abbrev. I like to surprise. I am afraid of fire and bridges. I can make cupcakes for your wedding, if you’d like. I am honest. I have an overactive imagination. Although this is an excellent description of Kim (another quality is that she is self-aware), there aren’t nearly enough adjectives. For example, I know Kim to be a GENEROUS cook and EXCEPTIONAL baker and I was thrilled when she jumped at the chance to share her joy and teach me one of her favourite dishes. The night before our lesson, Kim sent me this e-mail: “I’m all set for our cooking lesson tomorrow! Aprons are ready, groceries all set, recipe printed, music options prepared.” This made me feel a little bad that with all this running around I was SQUEEeeeeEEEZING her lesson in between appointments. Here she was getting ready in the best way possible. I realized how this cooking experiment of mine is really putting my friends out by asking them to teach me, not just by lending their wisdom and talent, but by setting aside time and preparing for it too. Of course, Kim should have treble in the kitchen, if you are what you wear: it’s cute, mischievous and musical! Also, she should wear the cupcake apron. 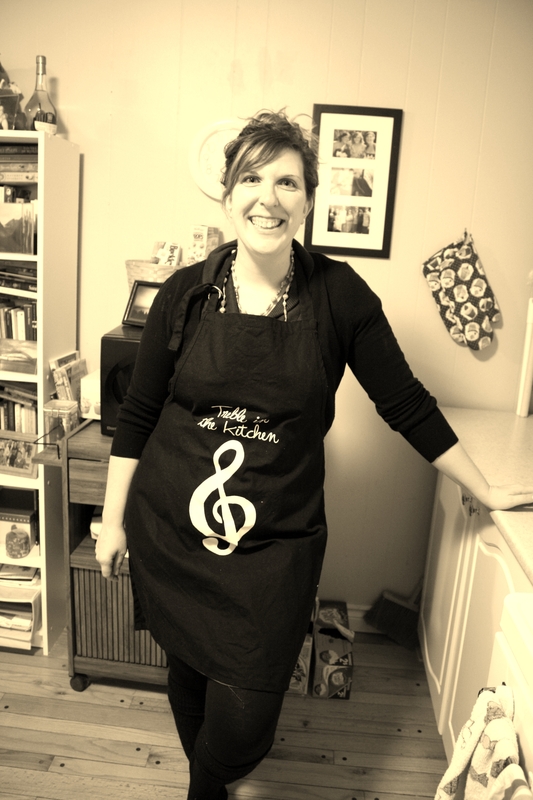 “Two of my students bought this [“Treble in the kitchen” apron] for me. We went out for tea in the summer to talk about their summer adventures – one of them had gone on a mission trip… The cupcake one, Ruth Ann bought it for me and it has matching oven mitts. I do have lots of aprons, some were my grannies… I only wear them when I’m baking.” That’s because icing sugar gets everywhere, on clothes, walls, and even, as she showed me, toasters. Friends, meet Kim’s kitchen. This woman who cooks and bakes more than the average person has a very limited area to do it in. When I asked her about how she manages in such a small space, she definitely has her eye on the silver lining. “The kitchen is really functional! I’ve made over 200 cupcakes in this teeny tiny space before. But obviously I have dreams about my ‘forever kitchen’ would look like. The kitchen is so small that you’re not really far from anything. Yes, I only have a small counter, and one sink, but it allows me to be really resourceful. It’s what I need it to be… for this stage of life that I’m in… Now cooking with two people might be a little more difficult.” The latter, a challenge we were going to accept on this day. 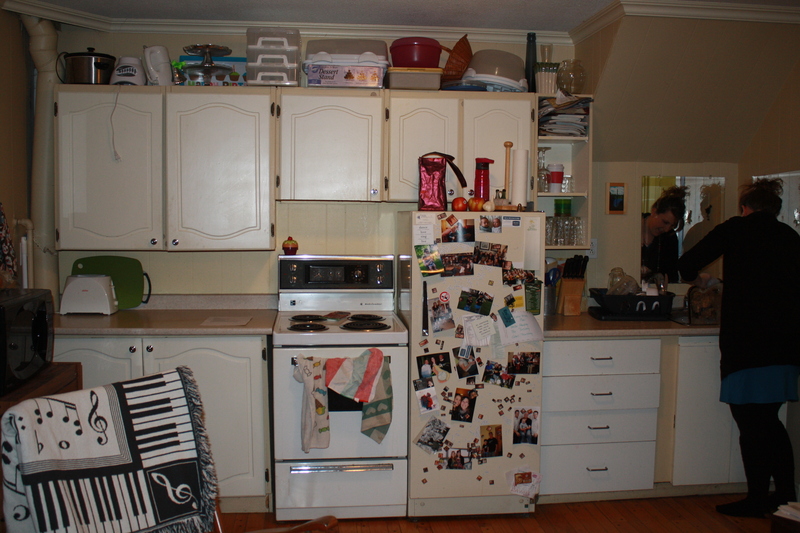 Because of the layout of her apartment, Kim’s kitchen is a part of her homey space, throughout which she has keepsake of the people and special moments in her life. 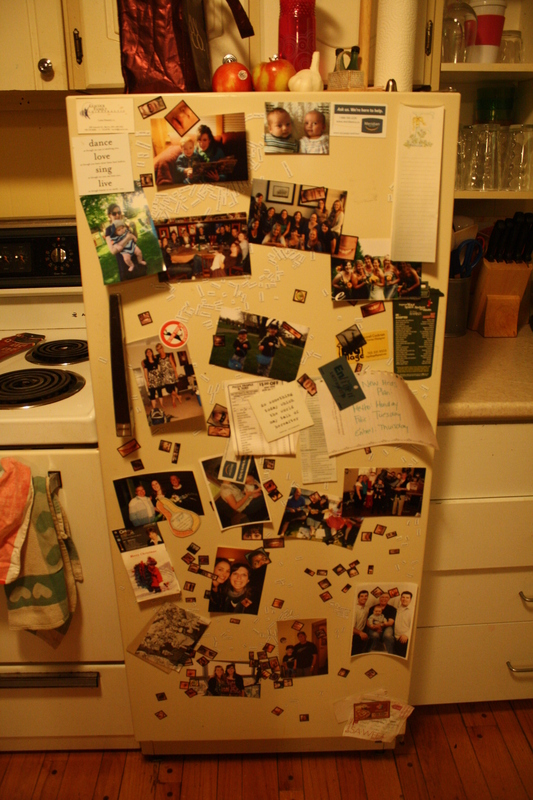 The fridge displays a collection of memories and motivational messages. Kim picked “Silly Greek Chili” for our lesson. Heat olive oil over medium high heat in a large non stick pot. Add chicken. Cook and stir chicken until lightly browned, but not cooked through, about 4 minutes. Add onions, zucchini, red pepper and garlic. Cook and stir until vegetables begin to soften, about 3 minutes. Stir in chili powder, cumin, and oregano. Cook 1 more minute. Add tomatoes with their juice, pasta sauce, chickpeas, brown sugar and pepper. Bring to boil. Reduce heat to low. Cover and simmer with 15 minutes. Remove from heat. Ladle chili into serving bowls and top with feta cheese. We started with chopping: pepper, zucchini, onions. I told Kim about my mom’s tip to keep from crying, by holding a piece of bread in the roof of your mouth, but Kim only had Ritz crackers. We tried them. My eyes still stung, but it was great fun trying to talk to each other while keeping the cracker intact. Kim’s tip is not to measure out a cup of veggies as the recipe says, but use one whole veggie, that’s the beauty of chili. Because what’s the point of storing, for example, 1/8 cup of the chopped zucchini? If you have ideas, both Kim and I would be open to hearing them, otherwise, it gets dumped into the big pot. Then the chicken. Squeamish factor is high with the raw chicken versus raw beef. Kim accidentally purchased skinless, but not boneless, so we had the added pleasure of sawing off the meat from the bone, which was all kinds of messy and Kim made full use of the anti-bacterial wipes. We weren’t sure what to do with the bones and I said – as if I knew – that I’m sure people boil bones to make soup. I believe I read that in a fairy tale when I was a kid. I just don’t know how that works (add that to my “to learn” list, along with gravy). Kim stored them in a Ziploc and said she’d look into it. As we started mixing ingredients, I asked Kim to document my efforts to stir. Very. Important. Stuff. I discovered what you will not see on a list of Kim’s interests or talents is photography. But seeing as I detested cooking up to a couple months ago, I believe there is hope for her. What a great blog, Lori. I can absolutely sense Kim’s warmth and joy! The recipe looks delicious – I’ve never made a chicken chili. May just try it this week! SPOILER ALERT: the recipe is delicious! You should! You really shouldn’t stir with your camera. Perhaps that is why the image is blurry. Just sayin’. Aw, I love this! Kim also shared the Greek Chili meal with us and we’ve eaten it SO many times! Looks like such a fun time! I LOVE it! I’m so sorry I took such a blurry photo – photography is NOT on my list of talents!!! I wish we were having another cooking lesson tonight!! so great! I can feel the love between you :) I LOVE Kim’s “about” – hadn’t read it! You both crack me up (fyi-chicken bones can go in the green bin). And I love the title> perfect! Kim has made that Chili once for our family when needed, and I have made it for her during play season :) Its a GREAT “I CARE dinner”. My recipe card says, “Kim’s Silly Greek Chili” (not Hayley’s :/) Thanks for sharing the recipes Lor – your fans love it! Looks super yummy! Will also try it with the fam. Tell Kim she can bring it to me anytime, even though I am done having babies! Maybe *I* will bring it to you!